History Comes Alive in Smoklerville! When was the last time you immersed yourself in something unfamiliar? Maybe you traveled to a different country or even just an unfamiliar destination. At Tamarack Adventure & Retreat Center, groups do it all the time. 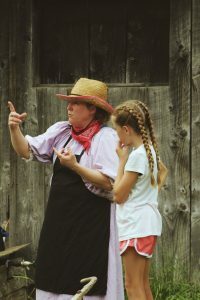 Smoklerville, or as it’s commonly referred to as Pioneer Skills, is a program where students have the chance to learn about 1860s America by truly living it. From costumes to challenges, students have to survive as a 19th-century homesteader family, learning more about Michigan history. This not only fun for students, but for chaperones as well. 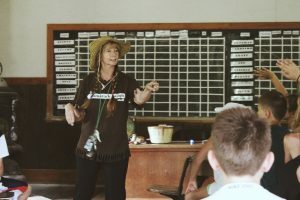 Chaperones take on roles in the town, put on costumes and interact with the kids while they read from their character’s notes. Roles range from Farmer to Sheriff, Fur Trader to Saloon Keeper. Tamarack Tom is always a favorite character. His job is to roam around town and mislead “settlers” by giving them false information. Not all of the first settlers were honest; some lied and stole, hence Tamarack Tom. But that’s not the only trouble they can get into. There are certain rules families have to follow while they roam. If they don’t follow those rules they can be thrown in jail by the Sheriff. As they wait behind bars, their families have to pay a fine! Students are grouped into families and assigned names that represent their heritage. They have to survive the year by finding certain things. They learn how settlers grew crops and built houses. 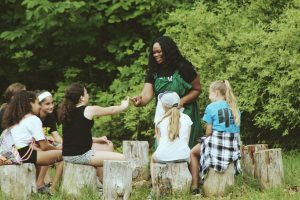 As students go around to different buildings, they have to purchase food, trade for fur, and learn about their “family.” The chaperone playing the role of Town Historian tells them about their family’s heritage and how they landed in the town of Smoklerville. Each family story is different. Students won’t leave town with just a new experience, but a souvenir of their time in 1860s America. In the candle shop, they make their own candles by alternatively dipping wicks into wax and water, layering until it’s the size of their finger. Smoklerville allows students to enter a whole new world (or old world in this case). At the same time, they are completing a challenge and working as a team. When students cross the bridge into a different time period and see the old school house, the old town front, the barn, and the Smith building they are transported to a town they’ve only read about. By stepping over the bridge, through time, students receive visual and experiential knowledge that adds depth and understanding; a true historical immersion.